The link to this story was actually sent out by the official Deus Ex twitter account, and with good reason: some of the stuff Japanese pair XSENSE (artists Yoshinori Sakamaki and Taketo Kobayashi) are coming up with looks like it came straight out of Human Revolution. 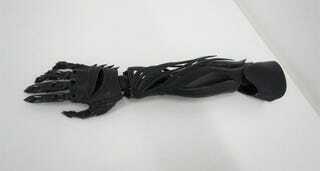 Using 3D printers, they're designing artificial limbs that go way beyond being simply practical. They've developed a range of limbs called "More Than Human", which 3Ders say "focuses on producing artistic prosthetic limbs that capture the identity and soul of the wearer and turn the negativity of using a limb into a positive expression of the self". The arm above, and the "mecha" leg seen below, are awesome.